Oftentimes, the marital home is the most valuable asset in a divorce. A family home can also have strong emotional ties. Here are some things to keep in mind about your home if you are in the process of a divorce. Regardless of how the home equity is divided or who is deemed responsible for the mortgage payments after the divorce, if your name remains on the mortgage, you remain equally responsible to the bank. A court order only permits an ex-spouse to sue the obligated spouse for nonpayment. The Court has no authority to remove a spouse’s liability with the bank. The only way to remove a spouse’s name from a mortgage is for the other spouse to assume the mortgage entirely, refinance, or sell the home. All marital assets and debts need to be considered in property division. In many instances, it is unlikely one spouse would have cash to “buy” the other spouse out of the home. One spouse may keep the home and related mortgage and the other may get more in investment and retirement accounts. The spouse keeping the home could also take on more marital debt. In property division, total marital assets and debt are split, but that’s not necessarily half of each asset and debt. There are several options available in dividing total marital equity. If you are contemplating keeping the home, be sure to remove the emotional attachment to the home, and truly consider whether it makes financial sense. Can you afford all the costs to stay in and maintain the home? Will you be able to pay for any major repairs? Keeping a home you cannot afford will only lead to financial troubles later. If cash flow is a concern, it may be unwise to give up more liquid assets, such as investment accounts, just to keep the home. Remember, your home does not provide you with cash, and is typically not an investment for retirement. Giving up assets such as retirement accounts to keep the home may not make long-term sense. Letting go of a retirement account, which will provide you with future income, is risky. You must look at your long-term goals and needs, as well as short term major expenses that may be looming. A Certified Divorce Financial Analyst® (CDFA™) can explain the financial aspects of divorce, help you evaluate all pending financial decisions, and empower you to make educated decisions during the highly emotional divorce process. There are tax implications to consider as well. The tax implications relating to the gain on the sale of a home are much different than the tax implications of selling investments or drawing from a retirement account. As a single individual, you typically can exclude $250,000 of gain on the sale of your home. However, selling your home will generally cost you 10% in selling expenses. Drawing from a pension account will result in taxes at ordinary rates, which vary depending on your income. You could also pay an additional 10% penalty on pension funds you withdraw if you’re under the age of 59 ½. Gains on investments are taxed at lower capital gains rates. However, depending on your level of income, you could end up paying additional investment income taxes. Accordingly, you should seek the advice of a tax advisor to understand the tax costs associated with the assets you receive and their impact on the net value of the asset you receive. 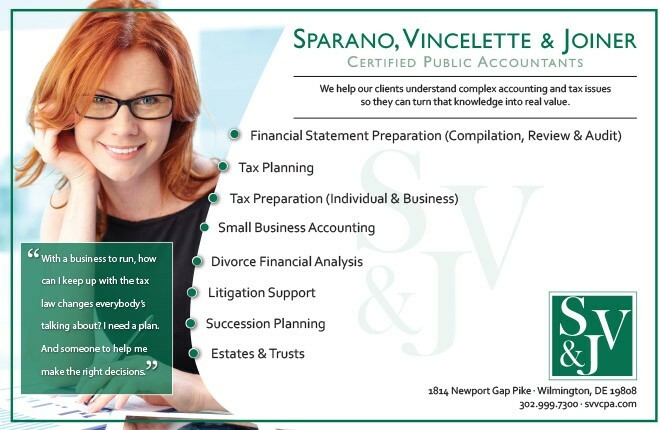 Evelyn M. Joiner, CPA, CDFA™ is a partner at the firm of Sparano, Vincelette & Joiner, CPAs in Wilmington. She started her accounting career in 1999, obtained her Master’s degree in Taxation, and is the only CDFA™ in Delaware who is also a CPA. You can find her on LinkedIn at linkedin.com/in/evelynjoiner. 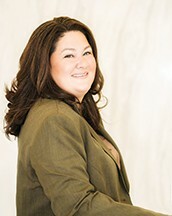 Headshot by Shannon Adelson of Adelson Media, Inc.